Fake Plastic Tunes: Girl in a Coma "Exits & All The Rest"
Coming from San Antonio, Girl in a Coma formed when Jenn Alva and Phanie Diaz met in Jr High with a mutual love for "the Smiths, Nirvana, and skipping school." Eventually Nina Diaz, Phanie's younger sister, joined the band on vocals. The band eventually hit the road in efforts to build up a fan base. In 2006 playing New York's Knitting Factory as part of a cable tv show for unknown bands. Producers were so impressed they signed Girl in a Coma to their label, Blackheart Records. In 2007, the band released their debut album, "Both Before I'm Gone." The ablum recieved positive reviews and much praise from Alternative Press Magazine, the LA Weekly, among many others. Also reaching number 23 on Billboards Heatseekers chart and 21 on iTunes. The albums first single "Clumsy Sky," won an independant Music Award. In 2009 Girl in a Coma released their followup album, "Trio B.C." Songs ranging from a punk rock version of Selena's "Si Una Vez" to Joy Division's "Transmission," which happens to be a personal favorite. In 2011 with material building up, the band headed into the studio to release their latest effort, "Exists & All the Rest." The album kicks off with the song "Adjust," Nina's voice starting off soft, going into a howl with the accompaniment of Phanie's drums and Alva's bass. The album flows into the song "Smart," which happens to be my favorite track on the album. Showing the bands diversity and love for a melodic pop song. 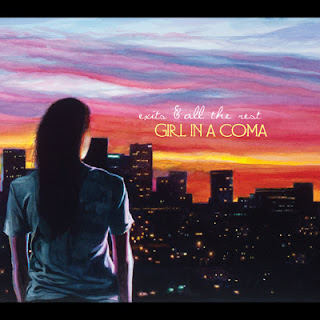 I can't seem to figure out who Girl in a Coma sounds like, which I've concluded is a good thing. If you are looking for a band with strong vocals and a unique sound, Girl in a Coma is the band for you. They are currently on tour, so don't miss out.